These pages give a little information about me but mainly present some of my work (software and art). I hope you find something of interest, even if it's only looking at the pictures in the galleries. If you like what you see or have suggestions for work/improvements, then please drop me a line. 12/10/16 - New releases of SourcesPro and SourcesLite are out - v1.4. The principal change in SourcesLite is the removal of the timeout feature - you can now use the free app with no interruptions. The principal change in SourcesPro is the addition of "limits" - these allow you to restrict sources to start/stop at a chosen wave position rather than covering the entire screen. Details of changes here. The pdf manual has been updated here, the online pages to follow soon. 6/4/16 - The recent months have been spent primarily on art - in particular getting to grips with relief printing. About 10 prints are now pretty much ready and the first few are appearing on my Etsy and Folksy shops. 1/3/16 - The problem with Drawcam crashing has been tracked down and fixed - a new release very soon. I have been unable to recreate the crash in Sources and it cannot be the same problem as in Drawcam. 5/10/15 - A problem has come to light in both Drawcam and Sources causing an immediate exit from both apps - I believe it is when using the draggable visual controls to change parameters. This is something new with Android 5, never having appeared in any other version. The apps crash in system code totally unrelated to my code and do so randomly and very infrequently. I will fix this as soon as I can track it down. It's going to be tricky. Apologies if you have been affected by this problem. On the plus side, I have code working for a cool new feature in SourcesPro. Rather than sources covering the entire screen, you can set their starting and finishing points (most probably in terms of wavelengths) and how abruptly they fade in/out. This adds a lot of new possibilities! 29/4/15 - As part of the submission for Facebook review of the next version of Drawcam, I may have inadvertently disabled posting photos to Facebook. Apologies if this affected you. Things should be back to normal and a new version of Drawcam should be out very soon to handle the incompatible revision of the Facebook API coming into effect on 1/May. 28/4/15 - Version 1.0.2c of SourcesWP released - this adds three new live wallpapers - that's a total of 22 now. Remember - you can modify these or create new ones using SourcesPro. "limits" - rather than sources filling the screen they can be limited to a start and stop position. "generated textures" - geometric textures (circles, squares etc) will be generated on the fly so that they retain their crispness at all sizes. 26/4/15 - A new version of SourcesWP is due for release - this simply adds a couple of rather nice new live wallpapers. 25/4/15 - A new release of Drawcam is imminent, awaiting approval from Facebook. This is to conform with the new API to be introduced on 1/5/15. As part of this process an Application Privacy Statement is required. In a nutshell - we collect nothing, we store nothing. 15/4/15 - An update to Drawcam to handle a small bug which occurred after updating to Android 5. 7/1/15 - A number of new paintings and a couple of linocuts uploaded to the Art Work pages. A lot of new digital art has been created with SourcesPro and this will be uploaded soon. A new version of SourcesPro will be available soon-ish, with the major enhancement being the ability to limit the scope of sources. 2 new filters - "colour etching" and "mono etching"
a list to select the current filter - just click on the filter name field. a list to select which functions should be available - from main menu. The 10s tutorial has been updated as has the Reference Guide. 07/5/14 - Updated the Art Work section - two new pages of work in various media - ranging from Photoshop thru' acrylics and oils to silver wire and resin. 06/5/14 - A new version of Drawcam very soon. Clicking on filter name gives you a picklist to choose from and there is a menu option to allow you to control which filters should be available and which hidden. 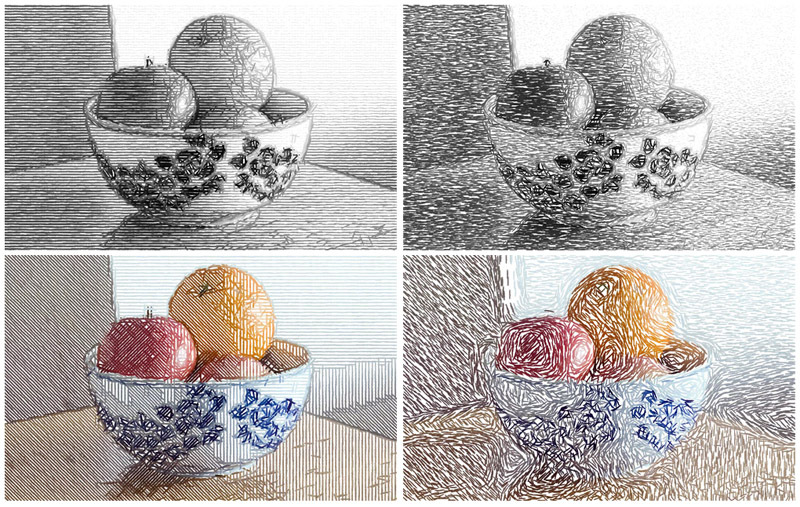 In addition, two new stroke-based filters - kind of etching-like. 16/4/14 - Changes in Drawcam v1.1 detailed here. 24/2/14 - A major new release of Drawcam soon. New filters - at least two, probably more - will be included . The new filters are more "natural media" oriented and at present they are looking rather good. Just a bit of polishing to do! A number of new, high-quality, large-scale images have been prepared, possibly with a view to selling them as limited edition prints. More details to follow. Two new features have been tested for SourcesPro. In the first, the output of a source can be limited in scope - rather than just covering the entire image area. In the second, a source can be made to distort the source (or all sources) below it whilst remaining invisible - this opens up a whole new range of images. 23/12/13 - Woo hoo! A rather favourable review of Drawcam just released by AndroidAppsReview. A smattering of comments: "a truly excellent photo filtering title", "(editing) with an almost astonishing level of detail" and "The application is a phenomenal deal". The only thing they didn't like was the look of the app - reckoned it was a bit "retro". It's actually based vaguely on my current DSLR so it ain't that retro, lol. 23/12/13 - v1.0.7b of Drawcam released. This fixes compatibility problems which came to light with some devices. Android is painfully variable between devices, the cameras on Android devices doubly so. 14/12/13 - v1.0.7 of Drawcam released - fixes for the various bugs Google decided to put in, especially in the 2013 Nexus 7. 11/12/13 - 2013 Nexus 7. All of the problems below are in Android itself, and are fixed by the latest system update to 4.4.2. To Google: maybe you could do a bit more testing before releasing next time, guys? 08/12/13 - Bizarrely, more Sources problems have turned up - and all on 2013 Nexus 7 when running Android 4.4, but not on Nexus 4 running same Android on same GPU. Sometimes the app will take 10 sec to exit from the animation screen via the "Done" button, but instantly via backspace or long click. A fix for this is in the v1.3.2 release. In SourcesPro, sometimes creating a 4000 (or even 3000 pixel) image can crash the app - but after the image has been correctly created and saved (your design will also have been saved in "-AT_EXIT-"). Do remember, however, that a 4000 pixel image will require a considerable amount of time to compress (especially where it contains texture - 30sec or even a minute is possible), so do not exit the app while the busy notification is still on the screen. Even more strangely, the app (Pro and Lite) will slow down to a standstill when switching screens if you have 12 or more sources, and it seems not to depend on what types of sources these are. I have never used more than 9 sources to create a design, so this is not so urgent an issue. These remaining two problems will be fixed as soon as possible. Fixed by latest Android system update. 04/12/13 - v1.3.2 of Sources - Pro and Lite and v1.0.2 of Sources WP to be released in a day or so. Problems have shown up in the handling of the rotating waveforms in the last release. Second, after all this time, the Colour Burn and Colour Dodge modes have suddenly failed on Adreno 320 GPUs (under android 4.4, I think) - so Nexus 4, new Nexus 7, maybe Samsung S4 etc. affected. Both problems fixed, just final testing and builds to do. 03/12/13 - v1.0.7 of Drawcam soon to be released. The new "Google" Nexus 7 does not obey Google's own API, so that's one fix, and after many years they have decided to change how picking media files (images) works - that's another. Don'tcha just love Google? 28/11/13 - v1.3.1 of Sources released - finer control over functions and some other properties, improved crop screen, fixed demos for Android 4.4. Details here. 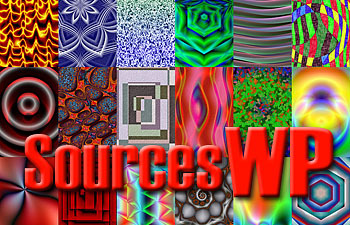 New version of SourcesWP released to take advantage of the finer control in SourcesPro 1.3.1 New option to let you run wallpaper at chosen animation size (at highest quality) or expanded up to fill the screen (the current, and default, behaviour). Guide updated. 10/11/13 - Woo hoo! v1.3 of SourcesLite and SourcesPro released in Google Play. These feature tons of improvements and new features not the least of which is the ability to create and edit Live Wallpapers in SourcesPro. To run the wallpapers, the new, free SourcesWP "app" is also launched today - featuring 18 built-in designs. More details here. A video showing the 18 wallpapers running can be seen here. As you will see it's up to my usual standard - I fear the mysteries of getting good videos up on youtube still defeat me. 5/10/13 - A cool new feature will be in v1.3 - export to Live Wallpaper - something a number of people have asked for. (My interest in Sources is in the production of high quality still images.) This will be present in SourcesPro only and will require the presence of the new SourcesWP app, which will be free and will come with a number of built-in wallpaper designs - fuller details to follow. As live wallpapers are quite demanding of resources, especially battery, SourcesWP can be made to run for a given time and then stop, replacing the last frame with a full quality render. Animation will resume from that point if you hide the home screen for whatever reason - or you can double click on the screen. If you prefer, this behaviour can be disabled. 16/08/13 - List of changes in v1.3 available here. 15/08/13 - The latest version of Sources (1.3) is ready for release. There are a number of changes, the most notable new feature being multi-level undo/redo. Given the "what-if?" nature of the app this is a huge improvement. Operations omitted from undo before (pin and crop) are also now included. Many new waveforms, accel/decel sources etc. New web tutorial ready, new pdf ready. RealSoonNow! The rather ropey youtube video ended up on an Indian web site - looked better there than in the original for some unknown reason. Problem is that the people reviewing are in a hurry and really don't want to be bothered with a large, highly featured app that really requires reading a manual or viewing a video tutorial. Sources is definitely more Adobe Illustrator than RudeNoiseGenerator. The depth and complexity, of course, lead to an app with an extended lifespan - I am still finding new images/ideas. These reviews/mentions are a fairly poor return from contacting 60+ web sites/reviewers. Bottom line: even the "free" review sites end up writing to you asking for money, with few exceptions. 22/03/13 - Woo hoo! Drawcam is officially published on the Android Market. 13/03/13 - Updated reference guide. App is pretty much ready for release - Twitter/email/App sharing all in now. Facebook integration to follow ASAP. 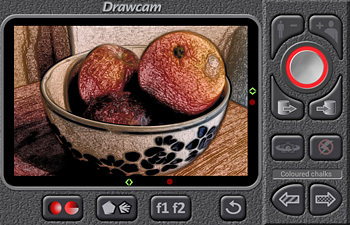 25/02/13 - A 10 sec tutorial for Drawcam is now up. A slightly longer, reference guide is also available. 21/02/13 - The new camera app is just about ready for release. At the moment it's called Drawcam, but that may have to change... Some screen shots and examples of its capabilities can be seen in the Drawcam page. 27/05/12 - SourcesPro is up on the Amazon App store for Kindle Fire. Of course, it's buyable only in USA, so I can't even verify it (Amazon do a certain amount of mucking around with it.) No videos have appeared yet, alas - seems the app is approved by one team ( took about 10 days) and the videos by another. How long does it take to watch two, 2 minute videos? (Answers on a postcard only.) The Kindle Fire is rather neat for the price, though. Seems that people have finally agreed that the Android operating system has some serious race condition issues - turns out it is present in the underlying Linux kernel. Android 4.0 uses an updated kernel which should FINALLY remove these awful problems. Shame it won't be seen on many of the phones currently out there. 16/04/12 - A couple of videos ( animation plus still pictures ) uploaded to youtube. I seem to be having real problems getting decent quality. One of the big things about Sources is the quality of the graphics and that is rather lost in the videos. 23/03/12 - v1.2 is just about ready. Features new Demo functionality which runs a number of introductory lessons by taking control of the App. Looks pretty neat. There will be some tutorials showing how to achieve specific effects as well. Then onto the Amazon market place! Got myself a Kindle Fire through ebay, though you seem to be able to buy it in a few UK dealers - like here. It's really pretty good, especially considering the price. Of course, they just had to tweak Android a bit (just like everyone else), but nothing too radical - main problem was no device Id - for some proprietary rights reason apparently. 03/03/12 - v1.1 of Pro and Lite released. Will be withdrawing Lite in the near future. Some nice changes - very useful sources strength attribute (effectively, controls opacity) and more attributes in a now-scrollable visual edit palette. Updated help. Will put out updated pdf file in next few days. 13/02/12 - SourcesPro published on Android Market - a mere £1.25 - buy a dozen! Instructions on how to transfer definitions from SourcesLite to SourcesPro here. Epilepsy warning is now available on-line here. 12/2/12 - Two new pages of Gallery images. Mostly simple images, but designed to highlight the new "line functions" feature of SourcesPro. 11/2/12 - Got a review in Marketplace. "outstanding application" "pictures you can create with it are amazing". Which is good. The reviewer then goes on to give it 2 !! stars, because he has "sent multiple emails without reply", and "it crashes after 20 mins". Well, not a single email was received. The Lite version of the app is designed to shut down with a warning screen after 20 mins and it saves your work for you automatically. You have to wait a mere 30 seconds before launching it again, else you get the warning screen explaining what is happening and suggesting you upgrade to the full/pro version. Yep, the full version is not out - i was wanting as much feedback as possible from the free one, but that doesn't seem to be forthcoming. So, all in all, a real pain - 2 lousy stars for no reason. I'll put the full version out in the next day or so. 29/11/11 - New version of SourcesLite going out. SourcesPro is ready, publish (99 pence? shum mishtake shurely?) in next day or so. 13/11/11 - SourcesLite is out. The question is now - the Android bug I see on Samsung Galaxy - does it show on other phones? Fingers crossed. Posted some images from the new App on DeviantArt. 4/11/11 - Well, after my extolling the virtues of the Samsung Galaxy, I've wound up having horrendous problems with OpenGL on it. It seems to be a Google bug which shows much more on the Samsung for some reason. Google claimed it wasn't a bug, but said "it's fixed in Honeycomb". Ho hum.... Anyway, big push to get SourcesLite out in the next few days. 23/9/11 - A completely new version of Sources (SourcesGL ?) is almost ready. It is compatible with existing definitions, but uses faster rendering (2-10x) and adds a number of new features, the most useful being a load of new modes. You can create more vibrant images, but also more organic looking ones. Sweep sources are improved in quality and more useful now. Seems to work particularly well on Android pads. A release candidate version will be placed in the market in a week or so. All being well, all future development will switch over to this version, so I'm unlikely to release a paid variant of the current one. New trial version of current Sources released in a day or so - fixed a couple of small bugs and, more importantly, extended the trial period, the cut-off date, and removed watermarking from generated images. Work is also progressing on the iPod / iPad version of the program. 10/7/11 - Trial version published an Android Market. Here! 7/7/11 Trial version ready - full functionality, but 20 days time limit, watermark on images and stops every 15 mins. All set to go - try on son's San Francisco - no problems, then just by chance discovered that avoid/target modes don't work. A bug I have encountered before on other phones, but normal detection and work-around failing here. Added user option to force 32 bit colour if problem is found. 1/7/11 Got an Asus Eee Pad. Got Sources running on it, a few important cosmetic faults, but everything working. Main problem is the huge number of pixels - takes a lot of grunt to move 4 Mb per frame. If you use the same size render area as a phone it fairly flies along. I can see no effect of hardware acceleration. Need to examine more fully. 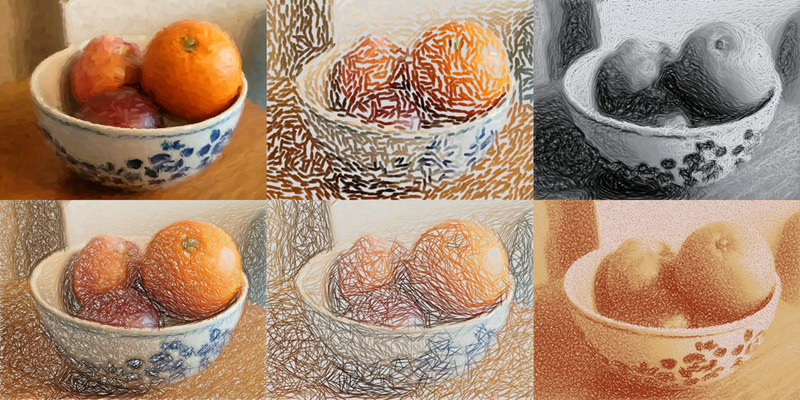 The fact that you can produce identical images on a phone seems a lot neater to me. 9/6/11 First tutorial available - pdf version also. 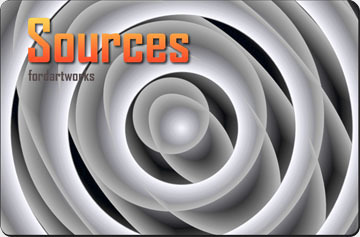 31/5/11 Well, my latest software project - "Sources" is finished and will be published in the Android Market at the beginning of June. What is it? A kind of generative art App for Android devices that allows you to combine simple geometric constructs in various ways. Surprisingly complex (and often quite beautiful) things can emerge. For example, the splash screen from the program is shown above. The background image and the one used in this page's banner were created with the App. Fuller details are given on the Sources page and a few pages of examples created using it are shown in the galleries. A couple of tutorials will be available soon.